This is my first post because, after hours of searching, I haven’t been able to find a good answer to this question. I am a limited hand tool user, but have found a hand plane to be invaluable for several tasks. One of which is quickly flushing joints that are not perfectly aligned. Such as a finger or rabbet joint that is proud by a 1/16” or so. Another example would be where a table leg meets the apron and you are working with face grains that are 90 degrees to one another. In these examples the woodworker is plaining with the grain, and then meets a joint in which the plane blade will be partially cutting across the face grain of a different board. 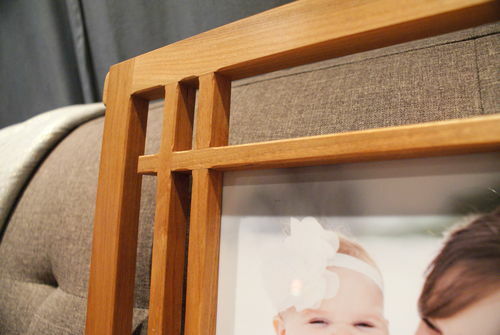 Using this photo as an example, I am planing the top portion of this frame, and come to the cross pieces, what style plane would be able to cut both direction of grain and make them perfectly flush? I am planning to get a new plane for Christmas and I am considering the Mujingfang 6 1/2 smoother and the Stanley Sweetheart No 4. The reason is that they are the same price, and both seem to be good quality for the money. The Mujingfang’s stellar performance seems to be related to it’s high angle. So I’m wondering if using this high angle plane would cause problems if I am planing along the grain and then come to a joint where I will be planing across the grain? Very sharp iron, skew the angle of attack, and really fine shavings will accomplish the task. Don’t be ham-fisted in your approach. I don’t have either of those planes, but the higher angle bedding doesn’t seem to be a plus unless the wood is highly figured. Both of those planes will need some tweaking as do all planes. If you’re not skilled at that………well, now is as good a time as any to learn. For me, I’d go with the Stanley unless you can get an older Stanley for a bargain. I agree with Andre in that I would go with a block plane. And I agree with Bill in skewing the angle of attack. So, my recommendation for this task (and a plethora of others) is a skewed block plane. If the Veritas is out of your budget range, vintage Stanley #140s can be had for less in the used market and are excellent users. Very sharp iron, skew the angle of attack, and really fine shavings will accomplish the task. I think this advice is more important than the type of plane. My personal preference would be to use a smoothing plane for this task simply because it would probably be in (or closer to) my hand already. If you’re looking at smoothing planes that are priced close to a new Stanley no 4, I would consider Woodriver. I have their #3, and I think it was a great deal. Very sharp iron, skew the angle of attack, and really fine shavings will accomplish the task. Don t be ham-fisted in your approach. Agree with this. A 3 or 4 bench or about any decent block plane will work. I’ve used both to do the same job. Skew the blade to 45. No need for anything special. Am I the only one who grabs a card scraper if I can’t easily plane so the endgrain sides are supported by the facegrain piece? I got a little japanese plane I like to use for that sort of quick joint cleanups where I can actually keep the sides supported, but otherwise I grab the scraper. A bit off topic but your mention of table legs meeting aprons reminded me of something I read recently. It is wise to offset the apron about 1/8” or so from the leg for exactly this reason: small misalignment – in construction or due to wood movement over time – is less noticeable if there is an obvious intentional offset. I read this, looked at a coffee table base I’d built years ago (without this advice), and immediately saw its value. Again, may not very useful to you, just wanted to share. I do own the Stanley SW #4 and like it, but I’d be concerned about getting tearout in your case. Scraper may be best option. I also agree with this. I have a 100+ year old Stanley #3. After watching some Paul Sellers videos I finally got it truly sharp and tuned and I am amazed at what it can do, and I don’t even really need to scrape or sand afterwards. I’d Skew a block plane and roll into it the other grain. Super light cuts. Don’t want tearout. Will scraps it after to even it out. Watch some doucette and Wolfe videos. One where casework is involved. a low angle block plane. and angle the plane for a angled slice instead of straight on. and would resharpen the blade before the work. or the time consuming way of sanding.